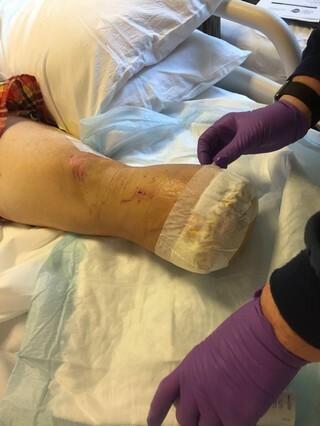 A 38 year old man who had his leg amputated after an accident cooked the remains of his lost leg and served it to his friends as a Mexican dish. The Mexican containing peppers, onions and human flesh. This sounds like a made up story but it appears to be strange but true. The man who prefers to remain anonymous first admitted his bizarre meal in a Reddit post under the user name IncrediblyShinyShart, complete with photographic evidence, and has since expanded upon it in an interview. IncrediblyShinyShart’s strange story began with a motorcycle accident. He was riding on a road through a forest when he was hit by a car that sent him flying into the surrounding trees. Doctors tried to save his leg but it was too badly damged by the accident. His only request was that he wanted to keep his discarded leg. This wasn’t a problem as most hospitals will hand over your removed body parts if you sign the appropriate paperwork. My mom, who was helping me get back on my feet, so to speak, drove me back to pick it up. She doesn’t know I ate it, though. I went inside and the hospital gave me my foot in a red plastic biowaste bag. I brought it to the car and immediately put it in a cooler. It was pretty bizarre. Originally I wanted to have it taxidermied or freeze-dried. How cool would it be to have my freeze-dried or taxidermied foot standing around the house as a lamp or a doorstop or something? All of this came out of the idea that it’s my foot. It’s not going to be cremated and chucked into a landfill. It’s a part of me, and I want it back. Shiny couldn’t find a taxidermist who would take his request seriously and he qs quoted over a thousand dollars to freeze dry his leg so he decided to eat it instead. On Sunday, July 10, 2016, Shiny, invited 10 of his friends to a very special lunch. One of his friends’ boyfriend’s was a chef and he volunteered to do the actual cooking. He suggested they eat the foot as fajita tacos. Much of Shiny’s limb was covered in iodine and formaldehyde but they managed to get a clean piece of muscle from his shin. The chef marinated the muscle overnight and sauteed it with onions, peppers, salt, pepper, and lime juice. Then he served it on corn tortillas with a tomatillo sauce. 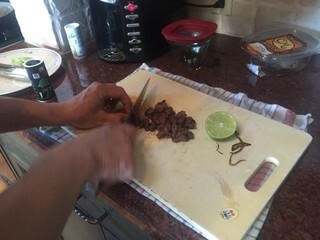 Shiny’s amputated leg being prepared in the kitchen. There was this queasy anticipation. We all looked at each other like, “We doing this, right? We’re doing this.” It had a very pronounced, beefy flavor to it. The muscle I cut was tough and chewy. It tasted good, but the experience wasn’t the best. It’s taken me time to get comfortable with it. It’s pretty out there. I put it out on Reddit because it’s pretty much anonymous. I like the really outrageous stuff that some people post there, and I felt this was a way I could properly contribute to this community. What I did was technically not illegal. I didn’t sell it. I didn’t give it to people without their consent. It was mine. We couldn’t find any real laws against weird stuff like this. So I’m not worried about legal stuff. I just don’t want to be known as that weird cannibal guy. It doesn’t really represent who I am. I am curious to eat human meat. Does that make me weird?